Bringing beauty to the indoors is a goal of any gardener in the winter months. 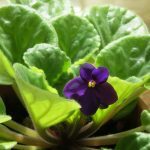 African violets have a reputation of being fussy plants, but with just a little care and the right conditions, they can thrive, bloom, and enhance any home. African violets (Saintpaulia) hail from the mountains of East Africa where the humidity and dampness provide ideal growing conditions. Baron St. Paul-Illaire, governor of a district in then German East Africa, first discovered the African violet. He was an amateur botanist, and collected seeds and specimens and sent them to his father in Germany. They ultimately landed with the director of Berlin’s Royal Botanic Garden. Seeds and plants were distributed around Europe and in 1925 found their way to the United States where breeding selection occurred. This process narrowed the choices down to the best ten plants and from there the thousands of cultivars available today have been developed. The most difficult part of growing this plant might just be choosing which one to grow. They come in literally thousands of named varieties with more being introduced each year. Plants are available with pink, blue, purple, white, and bicolor blooms. There are single and double flowering varieties with smooth, ruffled, or frilled petals. Leaves can range from green to bronze or have a pink to white variegation. Miniature and trailing cultivars are also available. As with any plant, African violets have specific water, light, temperature, and soil requirements. Probably the most important is the amount and type of light they receive. Without the proper intensity and amount of light, they will not bloom as proficiently as they are able. Bright but not direct light all afternoon (at least six hours) is ideal. Placed several feet from a west or southeast window where the direct light does not hit it, the plant will flourish. Alternatively, make sure those windows have some sort of shading, either by bushes on the outside or curtains on the inside and place the violet closer to the window. If natural light is not readily available, violets can be successfully grown under artificial light. Two 40 watt fluorescent bulbs placed 6 —12 inches above the plant and kept on for 15—18 hours per day will yield the best results. African violets are temperature sensitive plants. They will grow best if daytime temperatures stay between 70 and 75° and nighttime temperatures do not fall below 65°. Be aware of plants that are close to windows in the winter months and move them away from any potential cold drafts. Water management can also be critical with these beauties. 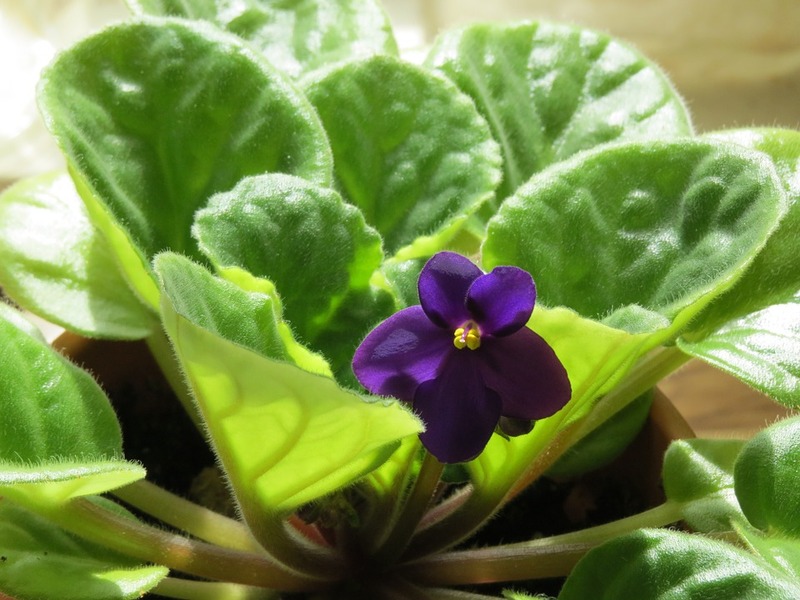 African violets prefer moist, but not saturated soil; never let them get completely dry. They can be watered from above or below. Self-watering pots with a reservoir in the bottom from which water is drawn upward by capillary action are readily available. 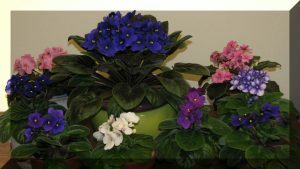 These work wonderfully for African violets; just be sure to follow manufacture directions when filling the reservoir to avoid soggy plants. If watering from the top, use sufficient water to run through the drain holes on the bottom of the pot. Then, discard any remaining water in the tray. Use room temperature water and avoid splashing water on the leaves to prevent leaf spotting. Do not overwater to avoid crown or root rot. Water to keep the soil moist, but not soggy. Winter months in Wisconsin can be too dry for these plants. Putting them on a humidity tray, a shallow dish with pebbles in it and with water nearly up to the top of the pebbles, will increase the humidity around the plant and make it much happier. If the plant begins to lose lower leaves more frequently, needs to be watered more often, or develops a long “neck” it is time to repot. A good rule of thumb is to simply repot African violets annually. Chose a commercially prepared soil specifically mixed for African violets or make a mixture of equal parts (by volume) of soil, peat, and vermiculite. Make sure when potting the plant to put the crown just above the soil line to prevent crown rot. African violets will benefit from monthly fertilization using a specific compound formulated for them. Phosphorus levels need to be high in order to get the beautiful blooms, so use something like a 12-36-14 fertilizer. African violets do have a few pests, but keep them watered and sunny, keep any stray dead leaves pulled off, and the pests will be minimal.